Illinois Lt. Gov. 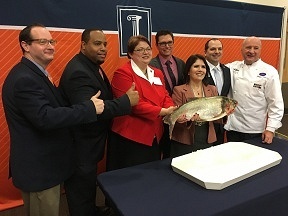 Evelyn Sanguinetti joined partners from Illinois and Louisiana at a luncheon in Champaign to showcase and encourage the human consumption of Asian Carp as a healthy food source in America. These efforts can have a positive ecological and economic impact for both states. Established a few years ago, this first-of-its-kind project has been an ongoing alliance among the Illinois Department of Natural Resources, Louisiana Department of Wildlife and Fisheries, and the University of Illinois, which has served as a liaison between the two states. In addition to increasing public awareness, the project also focuses on helping and encouraging fishermen to sell the fish. In an event, “Catch to Course,” hosted by the University of Illinois at Urbana-Champaign, Lt. Governor Sanguinetti joined partners, experts, and stakeholders at a luncheon where chefs showcased three dishes made of Asian Carp, also known as silverfin. Chef Philippe Parola of Louisiana, and Dawn Aubrey, associate director of Housing for Dining Services at the University of Illinois, have been involved in the project by raising awareness and encouraging ideas and actions for “catching” Asian Carp and then developing into multiple “courses” and cuisines. While the leading edge of Asian Carp fish migration has not moved since 1991, the State of Illinois in partnership with commercial fishermen and numerous stakeholders from our local, state and federal government continue to develop strategies to keep this invasive species from the Great Lakes.